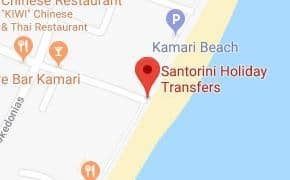 Santorini Holiday Transfers offers low-cost Santorini Hotels Transfers to and from your hotel in any location, village or destination in Santorini. The transportations are comfortable, reliable and at very attractive rates! Whether you want a mini-van or you prefer private transport to and from your hotel, we are ready to serve you to reach your destination in Santorini without delay. Book now and one of our professional drivers will be waiting for you to arrive at the Santorini airport (JTR) or the Port of Athinios. Our driver will help you with your luggage and he will take you right in front of your hotel’s door, so you can start enjoying your vacation on the magical island of Santorini as quickly as possible! Save time and money! No hidden charges! The service is covered by Flight or Ferry Arrival Delays! Experienced and professional drivers! We serve all the hotels of Santorini located in Fira (the capital of Santorini), Oia with the best sunset in the world, Kamari with the world-renowned beach with the distinctive black pebbles, Perissa, Firostefani, Perivolos, Megalohori, Monolithos, Messaria, Karterados, Pyrgos an extremely picturesque village with outstanding view on the Aegean sea, Imerovigli known also as the balcony of the island and all the other areas and villages of Santorini. We enjoyed your service last time. Our next vacation starts June 27th. Can we get the any discount on transfer to our hotel? Santorini Holiday Transfers was on time helped us with the luggage, well mannered driver! I booked a transportation from Santorini Aiport to our hotel in Oia. My driver came on time and was extremely kind. I will definitely continue to book my future rides to the airport with them. I just wanted to share a quick note and let you know that you guys do a really good job. I’m glad I decided to book my transfer in Santorini with you. Thanks, guys!